Craving a fresh Halloween costume this year? Nothing is fresher than Food Costumes! From Fruits to Ramen Noodles, you’re guaranteed to find your favorite meal ready and available for wearing – without the mess! Now family costumes can be a treat without the trick this Halloween. The only trouble you’ll find when it comes to this group costume idea is which type of food you’re going to dress up as! If you’re going for that classic, healthy look, Fruit Costumes will provide your daily recommended dose of good-humored fun this Halloween! For those that don’t like to rock the fruit bowl, a classic Banana Costume is a staple at any party. Be the brightest of the bunch and top banana while being asked to take pictures with new friends. 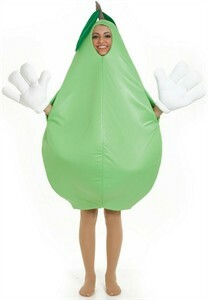 Adventurous and avid fruit lovers will love the rest of our collection of delicious-looking fruit costumes. Sweet Strawberries, Admirable Apples, Gorgeous Grapes, or Precious Peach the possibilities are endless! Not everyone enjoys the natural sweetness of fruit, for those that enjoy high fructose corn syrup running through your veins and a sugar high scrambling your mind, a Candy Costume is sure to show off your sweet tooth! Become your favorite sweet by wearing any of our iconic wrapper costumes. Gather your girls for a group costume that will have everyone noticing how scrumptious you look in matching candy dresses! Cereal Costumes are for those that want to reminisce about their favorite childhood breakfast and don’t find dressing up an actual food amusing. Everyone remembers yesteryear’s mascots that graced the boxes of our sugary-sweet cereals. With choices from Count Chocula to Trix the Rabbit, you’ll be the biggest nostalgia hit at any Halloween party! When it comes to Food Costumes, the only limit is your imagination (and stomach!). Nothing will make Halloween more festive than donning a Doughnut Costume amongst a group of people in Police Officer Costumes! Do you recall walking alongside your mother’s shopping cart and having the privilege to pick out your own cereal? Or maybe you didn’t get that choice and you had to secretly pine away for those Lucky Charms or Trix. Well, now’s your chance to relive those sugar-laden memories with these Cereal Costumes! Dress up as a Leprechaun in a Lucky Charms Costume, and reminisce about overflowing bowls of Lucky Charms drowning in milk and how you only used to eat the marshmallows treats. For those that root for the underdog, one underdog (or underrabbit, I should say) that will always be remembered is Trix Rabbit. He only wanted one bite of Trix, you rascally kids! Dress up in a Trix Rabbit Costume and attempt to steal every bowl of Trix you can find (or that you place yourself). Or you could represent the old-school cereals with a Count Chocula Costume and a Frankenberry Costume! Regardless of age, these cereal costumes are sure to be a treat at any party. So gather your friends and put together a sweet group with all of your favorite childhood cereal mascots to choose from! And if cereal just isn’t your thing, you can still be edible with these delicious looking Food Costumes. Funny Group Costumes that will Cause a Ruckus! The more the merrier applies to Halloween costumes more than ever! Group costumes may seem trendy, but they’re here to stay. What could be more fun than dressing up in crazy costumes with a group of friends or family? Fun can be doubled and even tripled when costumes are coordinated. Now add a pinch of comedy to the equation, and our collection of Funny Group Costumes will be your salvation! Play with your dinner and not get scolded for it by dressing up in a Food Costume! Go through all of the food groups and find a funny costume that suits you. Candy, cereal, fruits, and vegetables can all be on the same plate if you gather enough people. You don’t have to worry about cavities, upset stomachs, or your blood pressure. Food fights won’t involve stains, and you can dress up as your favorite cereal characters. Funny food costumes provide more variety than any other category! To deal with all of that food, Utensil Costumes are probably in order! Choose between the regulars: a fork, knife, and spoon. The fruits can’t cut themselves! Whatever party you crash, make sure it’s not a snooze fest. If it is and the silence is uncomfortable, cut the tension with a South Park Costume. Stop killing Kenny for a moment and cause trouble under the guise of this troubling crew. Television character costumes coordinate into amazing group and couples costumes because of the already defined roles. Look up your favorite show and imitate your favorite character! Assuming another identity for the night gives you a level freedom that can’t be replicated (legally)! Round up a great group of friends and have a blast in a Funny Group Costume!